Ceramic is the name for some materials that are formed by the use of heat. 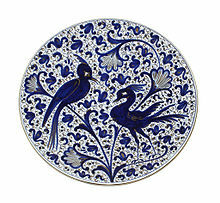 The word ceramic comes from the Greek word κεραμικός (keramikos). Chemically, it is an inorganic compound of metal, non-metal or metalloid atoms held together by chemical bonds. Many clay-based ceramic materials are hard, porous, and brittle. The study and development of ceramics includes methods to deal with these characteristics, to accentuate the strengths of the materials and investigate novel applications. The Simple English Wiktionary has a definition for: ceramic. This page was last changed on 26 May 2018, at 19:01.